Nimbus Libéré - Made in either 1943 or 1944, "Nimbus Libere" was made in Germany for the Vichy French. The strange cartoon shows a man, with his family, listening to the radio announcing France will soon be "liberated" by Allied forces. A Jew from London speaks to the radio's audience about the upcoming liberation. 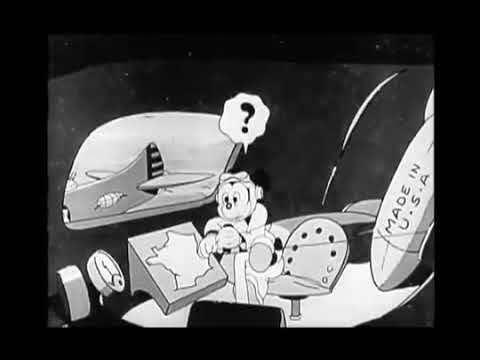 With that, U.S. Army Air Force bombers crewed by popular American cartoon characters, such as; Goofy, Felix the Cat, Donald Duck, Mickey Mouse and Popeye, drop bombs on innocent civilians. A bomb drops into the house of the man, killing all three family members, the Grim Reaper then glides down, switches the radio off while laughing maniacally. The purpose of the cartoons was to demonize the Americans, the Allies and Jews, exploiting the hard, sad truth that French civilians were killed during the Allied bombing campaigns throughout World War 2.